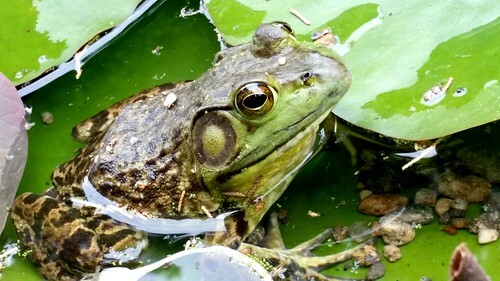 Photo Reflection of the Day #120: Ribbit! A frog hanging out in a frog pond at Long Hill in Beverly, MA. My wife and I went on a visit to Long Hill, a Trustees of the Reservation estate in Beverly, MA. It's definitely a nice place to check out (but be sure to bring the bug spray!). They have lots of beautiful gardens and spaces along with this little frog pond. We only found one frog--this fellow. I was known as the pre-eminent frog catcher at camp as a kid. I spent way more hours than I care to remember and lost my fair share of clothing, shoes, etc into the swamp. I'm not sure what my fascination with frogs were--besides the fact that they were in abundance at the came, they were small, and they were strange creatures. I often heard them croaking but whenever I was near one, it never croaked. It's hops were always amusing to watch and I think what I related mostly to the frog was the way that I swam. I wasn't graceful freestyle swimmer but stuck with the breast stroke--or the frogger!